Home / Ann Costantino / Are Baltimore County School-Funded Signs Being Used to Support Campaign Platform? The school-funded construction sign project consists of 58 6’x8’ wooden signs that were manufactured and installed at 58 Baltimore County Public Schools for about $2,000 apiece and which advertise school construction projects such as 15 new schools, 11 additions, installation of air conditioning and the elimination of overcrowding. The signs, which began popping up on school grounds in late 2016, were funded through the school system’s Facility Construction Capital and Site Improvement Funds, records show, and display the names of former superintendent of Baltimore County Public Schools, Dr. S. Dallas Dance, and County Executive Kamenetz, who announced his bid for governor in September. Dance left the system in June amid a criminal investigation and has been indicted on four counts of perjury related to failing to disclose income earned while moonlighting. A review of the County’s 145 polling locations reveal that 21 of the 58 schools with the “Schools for our Future” signs are designated polling sites for the County, including Lansdowne and Dulaney high schools which are in poor physical condition and have the lowest facility scores of all of the high schools in school system. Advocates for both high schools continue to fight for replacement schools. Kamenetz announced earlier this month that he would fund Dulaney’s replacement school, however the majority of the Baltimore County Council says it is not financially feasible. Advocates for Lansdowne, which is slated to be renovated and has the lower facility rating of the two high schools, are asking for equitable treatment and want a replacement school like Dulaney. Miller, who was appointed to the Board in December 2015, which was one year before the system contracted for the signage, was unaware the school system had paid for the signs. While the signs promote the County’s school construction projects and are not campaign signs, their timing – and especially their funding source – raises questions. 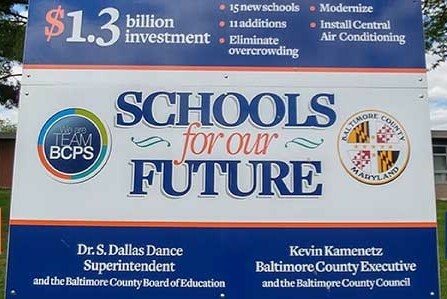 Five full years after Kamenetz’s 2011 “Schools for our Future” announcement, the school system contracted with the sign company. Nine months later, the county executive would announce his run for governor. Ten months from that announcement – this upcoming June – is the election primary. It is not yet clear which agency paid for the O’Malley and Hogan signs, at what point during their administrations they were installed, how many Baltimore County and Maryland schools have them, nor what they cost taxpayers. The Baltimore Post is awaiting responses to three open records requests. Rowe, along with at large board member, Ann Miller, and District Three board member, Kathleen Causey, fought for portable air conditioning units for schools awaiting renovations, replacement buildings or central air installation. They advocated to alleviate heat-related suffering during the warmer months when some classroom temperatures had been recorded at heat indexes of up to 104 degrees. New: Follow me on Twitter!